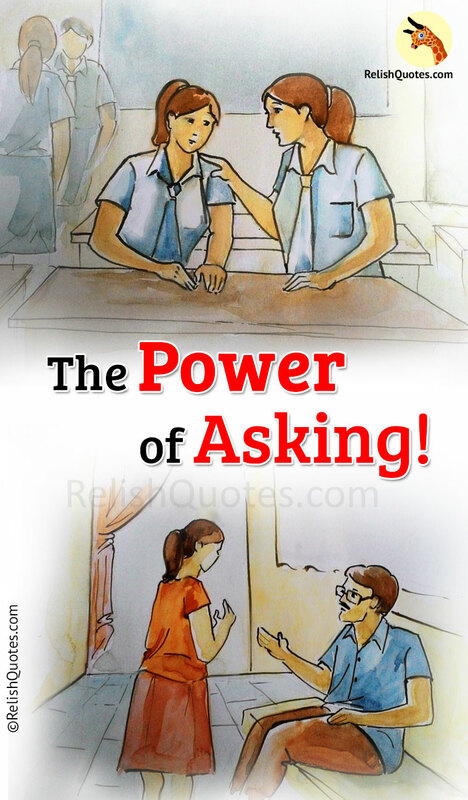 HomeShort StoriesInspirational StoriesThe Power of Asking! The whole class was on cloud nine when my teacher announced a trip to North India for 1 week. All of my friends were very excited about it and had already started making plans of what is to be done in the trip. I had no answers for her. I just grinned and turned my back to her. I realized that she was disappointed for my behavior. That didn’t bother me much either. Because I knew the reason for me not being excited. I knew the exact reason why. And I knew that none would listen to me if I told them my reason. I always thought they would mock at me. I was more like an introvert back then. It was our lunch time. While all of my friends were too excited as they thought it was the right time for them to speak and plan about the trip, I was all alone and all I had in my mind was to just gobble up whatever I had and get back to my class. But my friend Anjali wouldn’t leave me alone. No matter how much I ignored this friend of mine never got pissed with me. I wonder a lot of times, “How can someone be so sweet to a person”. I did not know what was her motivation behind talking to me everytime I turned my back on her. I just knew that whenever I needed her she was there for me. She came to me and as I was eating my boring Vegetable pulav, she consistently asked me why I was not ready to go for the trip. She kept throwing questions on me like, “Do you feel it won’t be fun? Do you have financial issues? Are you worried about getting bullied? Is there anyone who’s bothering you?” I was really testing her patience. The more she asked the more I started to ignore her. She left the place after trying in vain. I felt sorry for her but I didn’t feel like sharing what was going on in my mind. I felt keeping it to myself was a better option. Later I somehow felt that I should be sharing with her. I felt her efforts should be valued. She didn’t really have the necessity of talking to a dull girl after being put down. Yet she did it. I went to her and told “Yes Anjali there is something that’s bothering me.” She was delighted to see me willing to tell her my story. She said “Yes Nisha, go on. I’m all ears. Tell me what is it that’s bothering you. Talk your heart out”. I started telling her, “It’s my dad. My dad will never agree for this trip. He has never agreed before and I’ve stopped asking him anything from class 6. I am very tired of getting NOs and rejections. I would rather not ask him at all. I’m very sure that he won’t consent. Back then, when I was a kid too he used to refuse buying me the things I asked him. That has had a major impact on me. I really don’t have the courage of asking him again and again and being put down. It’s become a practice for me not to expect anything from my dad. I’d rather just attend schools and score good marks. I am not interested to come to the trip. That’s why I am not excited about it. Thanks for asking.” I felt like a baby who’s told all what was happening in its mind and is eagerly waiting for the reply now. I looked at her. Slightly smiled and told, “May be… May be.. I’m in for a surprise”. I didn’t believe in her words. I was scared that I’ll be put down again by my dad and he’ll deny my proposal. I was less excited but still after she spoke to me, there was a light ray of hope within me. I went home with a small ray of hope. I waited eagerly for my dad to get back home. This wait seemed longer than ever. My strict dad (That’s what me and my siblings call him) came home around 9 PM and as usual asked us to switch off the TV and study. I wanted to talk to him about the trip. I was acting like a child that’s wanting to express something but is not able to. I was like a small kid trying to find words and frame sentences. Somehow, I gathered some courage and told my dad, “Papa, my school has organized a trip to North India. It’s going to last for 7 days and the total trip fee is 12,000 rupees. All my friends are going. I would want to go too”. My voice was shaking and I was less confident. What happened next totally took me by surprise. A pleasant surprise! My dad said, “Okay I’ll give you 12,000 rupees in the morning. Be careful. Have fun. Take sweaters along with you, it’s going to be cold in North India” and he went to sleep. I couldn’t believe it was happening. I felt I was in a dream. I was wonderstruck and remained to be until my younger sister screamed, “Didi… dad just told yes. Go tell your friends you’re going too”. I rushed to my phone and called up Anjali. I told her whatever happened. I didn’t know how to thank her. I didn’t have words.